The threats are both external and internal. Internally, the flaws that became glaringly evident in the euro crisis have yet to be fixed. Prolonged economic pain has contributed to a plunge in support for the EU. Populist, anti-European parties are attacking the EU’s very existence—not least in France, where Marine Le Pen is doing uncomfortably well in the presidential campaign, even if the National Front leader is unlikely to win in May. The most dramatic result of the anti-EU backlash so far is Brexit. 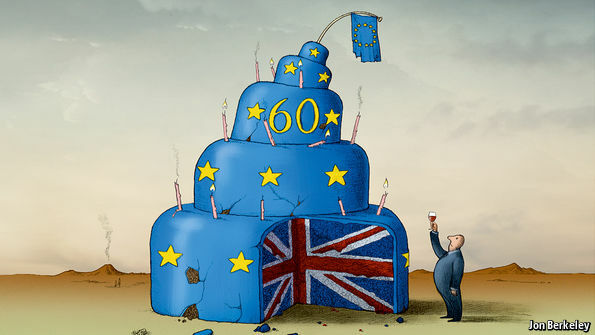 Britain’s prime minister, Theresa May, will not be in Rome for the birthday party; on May 29th she plans to invoke Article 50 of the EU treaty to start the Brexit process. Negotiations over Britain’s departure will consume much time and energy for the next two years; losing such a big member is also a huge blow to the club’s influence and credibility. The external pressures are equally serious. The refugee crisis has abated, but mainly thanks to a dodgy deal with Turkey. A newly aggressive Russia under Vladimir Putin and, in Donald Trump, an American president who is unenthusiastic about both the EU and NATO, make this a terrible time for Europe to be weak and divided. That a project set up to underpin Europe’s post-war security should falter at the very moment when that security is under threat is a bitter irony. It is also a reminder of how much is at stake if Europe fails to fix itself. The traditional response of EU-enthusiasts to such challenges is to press for a bold leap towards closer union. The euro needs this if it is to succeed, they argue. Equally, they say, more powers ought to shift to the centre to allow the EU to strengthen its external borders and ensure that it speaks with one loud voice to the likes of Mr Putin and Mr Trump. Yet the evidence is that neither European voters nor their elected governments want this. If anything, public opinion favours the reverse. If ever-closer union is not possible, another Brussels tradition is simply to muddle through. The euro crisis is past its worst, immigration has peaked and Brexit will be managed somehow. If, after this year’s elections, Emmanuel Macron is France’s president alongside either Angela Merkel or Martin Schulz as Germany’s chancellor, the club would be under staunchly pro-EU leadership. Yet muddling along has risks of its own. A renewed financial crisis that upset the euro again, or the election of another government committed to a referendum on EU or euro membership, could tear the union apart. Is there a better alternative? The answer, as our special report argues, is to pursue, more formally than now, an EU that is far more flexible. In Euro-speak, this means embracing a “multi-tier” system, with the countries of a much wider Europe taking part to different degrees in its policies—and able to move from one tier to another with relative ease. There has recently been a flurry of interest in the notion of a “multi-speed” Europe. But what most EU leaders mean by the term is that core members should be able to pursue common policies in areas like defence, fiscal or welfare policy; it implies that all countries are moving towards the same destination. A broader, “multi-tier” Europe would find a place for non-members as well. The continent consists of 48 countries and 750m people, not just the 28 countries and 510m people in the union, still less the 19 and 340m in the euro. The core of Europe will be those countries that share the single currency. To solve the euro’s ills, they need more integration and shared institutions—from a proper banking union to a common debt instrument. The next tier would comprise a looser group than now of EU members that are not ready to accept the sacrifice of sovereignty needed to join the euro, which some will not do for many years, and may never. Beyond that a multi-tier Europe should accommodate widely differing countries. That means a changed mindset more than changed treaties: in the language of Eurocrats, accepting a menu that is à la carte, not prix fixe. This is anathema in Brussels, where the idea that you can pick and choose the bits of the EU that you like is frowned upon, but it is what Europeans increasingly want. Countries like Norway or Switzerland may wish to be closely bound to the European single market. Others such as Britain may not be ready to accept the single market’s rules, but still wish to trade as freely as possible with the EU. They might seek a bigger role in other areas such as defence and security. And places like Turkey, the western Balkans, Ukraine and Georgia might prefer a similar associated status instead of today’s unsatisfactory situation, where they are told they are eligible to be full members but know they will never be allowed to join. To work, a multi-tier Europe should be pragmatic about the rules that each tier entails. Those in the outer group might not accept fully free movement of people, for instance, but that is no reason to wall off their access to the EU’s single market. Nor should there be a stigma of second-class status for those outside the core: after all, they include Denmark and Sweden, two of Europe’s most successful countries. Ways should be found for countries with military or diplomatic clout (eg, post-Brexit Britain) to join in foreign and defence policies. For the European project to survive another 60 years, the key is flexibility, in both directions. Just as Britain is leaving the EU, another country might one day leave the euro. Any such step will be hard to manage. But if the union cannot embrace differentiation, it faces the risk of disintegration instead. 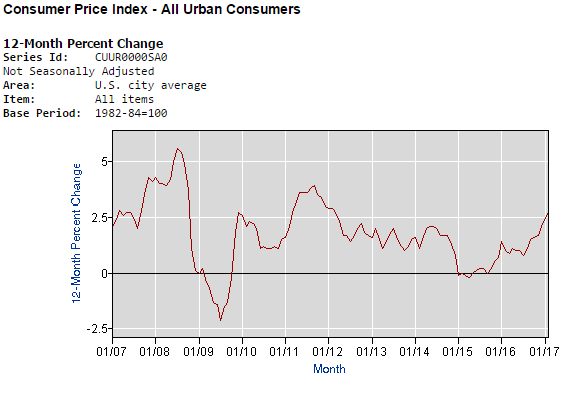 - Inflationary pressures took an abrupt turn south in 2011. - The U.S. stock market became a safe-haven for world capital flows from 2011 to 2015. 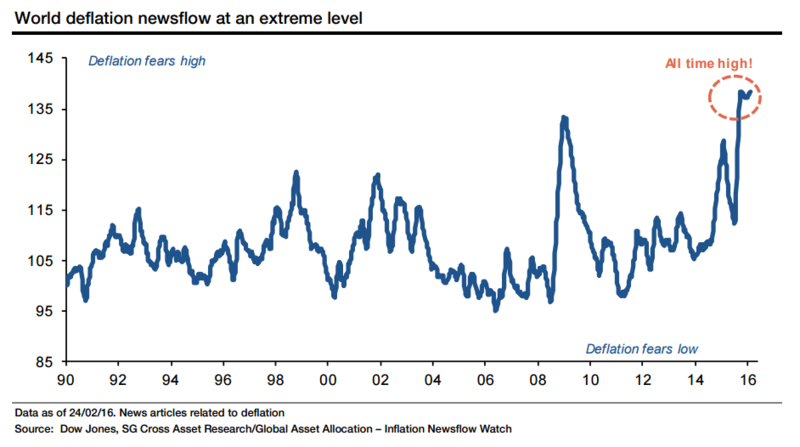 - After a peak in deflationary fears in early 2016, the inflationary narrative has gotten back on track. "A 60:40 allocation to passive long-only equities and bonds has been a great proposition for the last 35 years," …"We are profoundly worried that this could be a risky allocation over the next 10." "If I had to relive my life I would be even more stubborn and uncompromising than I have been. One should never do anything without skin in the game. If you give advice, you need to be exposed to losses from it"
Macroeconomic investing, or "macro" investing for short, is very difficult, as it is very hard to find accurate economic forecasters. We have all heard the jokes, and read the statistical data, about how almost all professional economists fail to see major turning points, particularly recessions, and that is why many value investors prefer to focus only on bottoms-up or company-specific research. 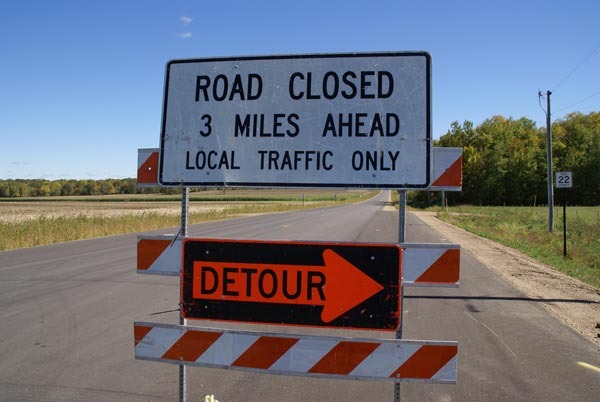 Over my 20-plus-year career actively investing, I have found that even the best value investors can get stuck in value traps. On a personal note, I have had my share of material miscues and value traps, and they can be very painful as fundamentals and historical valuations ultimately do not matter in these situations. Perhaps the best example of this occurred in 2007 and 2008, when value investors heavily over-weighted financial stocks in their portfolios, as they appeared cheap on fundamental metrics, including price-to-earnings and price-to-book rations, only to see some of the perceived safest companies in the world act like the riskiest companies in the world. During this time, formerly AAA-rated American International Group (NYSE:AIG), Fannie Mae (OTCQB:FNMA), Freddie Mac (OTCQB:FMCC), and General Electric (NYSE:GE), all venerable blue-chip assets during much of the bull market rise from 1982 through 2007, suffered Depression-level declines. Additional highly-rated financial stocks like Bank of America (NYSE:BAC), Citigroup (NYSE:C), Goldman Sachs (NYSE:GS), JPMorgan (NYSE:JPM), and Morgan Stanley (NYSE:MS) suffered tremendously too, not to mention the non-survivors, which included Lehman Brothers and Bear Sterns, two formerly venerable, world-leading investment banks. In summary, many hallowed value investors learned or re-learned the importance of macroeconomic analysis to complement their company-specific research. From my perspective, "macro research" is critically important today, as the global bond market remains in the midst of a transition phase from an epic secular bull market (i.e. rising bond prices and falling yields) to potentially a new secular bear market (i.e. falling bond prices and rising yields). The catalyst for this transition is increasing inflationary pressures and rising inflationary expectations. This transition has not been smooth, but if the secular 30-year-plus bull market in bonds is ending, it has massive investment implications for all investors, particularly those that have chased yields over the course of the current bull market that began in March of 2009. Inflation pressures are rising, sparking a transition from a three-decade-plus bull market in bonds to a bear market in bonds, changing the investment landscape dramatically. Similar to the sound of an oncoming train, deflationary fears peaked with a loud roar early in 2016. 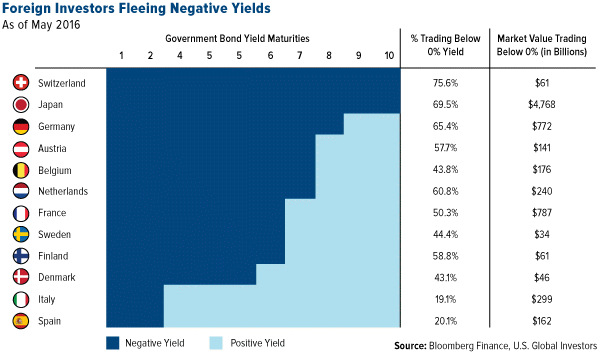 This prompted roughly one-third of global sovereign bonds to trade at negative interest rates in nominal terms, not even considering real rates, after considering the impact of inflation. Looking back, it is easy to see the palpable, cresting fear of deflation in the bond markets, stemming in part from investors' memories of the 2007/2008 global financial crisis, accelerated by the growth downturn in emerging markets, and punctuated by demographic worries. Global capital-flows reverted back to the United States, the proverbial best house in a bad neighborhood, even though the collapse in the speculative U.S. housing market was the catalyst for the previous downturn. As a result of capital flows, the U.S. dollar strengthened, rising from its lows in 2011, and taking flight in 2014, and U.S. securities, particularly large-cap U.S. equities, dramatically outperformed the rest of the world. In the second chart above, the S&P 500 Index, as measured by the SPDR S&P 500 ETF (NYSEARCA:SPY), has registered a gain of 101.2% the past decade, dramatically outperforming the iShares MSCI EAFE ETF (NYSEARCA:EFA), which has posted a gain of 9.3%, and the iShares MSCI Emerging Markets ETF (NYSEARCA:EEM), which has posted a gain of 24.2%. China, which has led the performance of emerging markets, experienced a growth recession from 2011 to 2015, but this period of contraction ended in 2016. The manufacturing upturn in China, which remains the world's manufacturing center, has boosted the shares of the iShares China Large-Cap ETF (NYSEARCA:FXI), which has outperformed the S&P 500 index by a healthy margin in 2017, gaining 13.1% versus SPY's 5.2% gain. Over the past year, the iShares China Large-Cap ETF has gained 22.3%, outpacing SPY's still healthy gain of 17.6%. The story changes over the past decade, which has been a disinflationary/deflationary decade. Even though China led the performance of international markets, it has still markedly trailed the performance of America's large-cap equity benchmark. In the chart above, I also added the 10-year return of the iShares 20+Year Treasury Bond ETF (NYSEARCA:TLT), which has been the second-best performing ETF of the group above, showing clearly that global investors have preferred both U.S. stocks, and U.S. bonds over the past decade as world financial markets have been stuck in a disinflationary/deflationary quagmire. 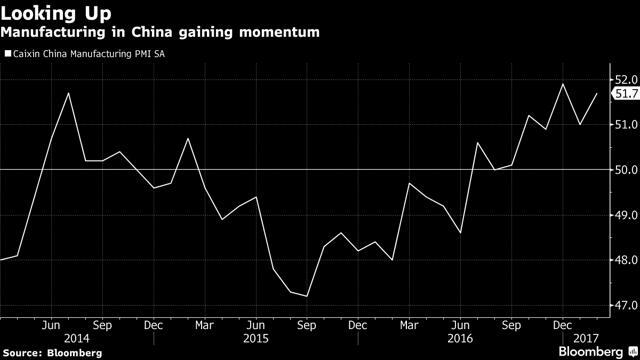 China's return to manufacturing expansion in 2016 has propelled inflationary readings higher around the globe. In the United States, the rising level of inflation is clear, yet it has remained in the background. With the labor market improving on a steady basis for the past eight years, and commodity prices higher from increased demand and reduced supply, inflation could continue to surprise to the upside for the duration of the current economic expansion. In the United States, the United Kingdom, Germany, and Japan, bond yields have all risen substantially from their 2016 lows, paying more attention to rising inflationary pressures than official policymakers, as deflationary fears abated and inflationary readings surprised to the upside. The charts above clearly show that 10-Year yields have reversed, and increased from their 2016 lows. However, it is not clear that the downward trends in yields have been broken. Once that happens, and I believe it will at some point in 2017, there is the potential to see a large move higher in rates, similar in magnitude to the 2013 U.S. Taper Tantrum. What would cause the next leg higher in sovereign interest rates? Higher inflation spurred by global growth that exceeds expectations and higher commodity prices could do the trick. An additional catalyst could be an unwinding of the Federal Reserve's massive balance sheet, which could spark a rise in U.S. yields as hedge funds and traders front-run the anticipated central bank selling. From my perspective, I think investors should be paying attention to the rate differential between the U.S. 10-Year Treasury Yield and the German 10-Year Treasury Yield. A narrowing of this gap will be positive for the inflationary/reflationary trade, in my opinion, particularly commodities, commodity stocks, and international equities. The two-year Treasury yield has been a more reliable barometer of economic strength and economic weakness than longer-term yields, and it is showing a positive divergence when compared to longer-term yields. What should investors not pay attention to? The answer is simple, the news. Over the past decade, U.S. stocks and U.S. bonds have outperformed almost everything, as disinflationary/deflationary fears have dominated the investment landscape. It should come as no surprise that commodities, and particularly commodity stocks, have been some of the worst performers over the past 10 years, as inflation has not been on the minds of investors, speculators, or traders. This is visually shown with the 10-year performance chart of the SPDR S&P Metals and Mining ETF (NYSEARCA:XME), the VanEck Vectors Gold Miners ETF (NYSEARCA:GDX), and the Energy Select Sector SPDR ETF (NYSEARCA:XLE) alongside the performance of the SPDR S&P 500 ETF, and the iShares 20+Year Treasury Bond ETF. Clearly, the commodity stocks have underperformed, with precious metals equities, and industrial metals equities, performing the worst over the past decade. Energy equities have underperformed too, but they have been buoyed by the relative outperformance of large-cap behemoths like Exxon Mobil (NYSE:XOM), and Chevron (NYSE:CVX), which have both benefited from dividend-focused investors and passive fund flows into index funds. Over the past one year and three months, the performance picture has been reversed, with commodity stocks now leading the broader stock market's advance, in what I believe are the final innings of the current bull market. Stocks like U.S. Steel (NYSE:X), Freeport-McMoRan (NYSE:FCX), and Cliffs Natural Resources (NYSE:CLF), all profiled in my "Too Cheap To Ignore" series of articles earlier in 2016, have risen from the graveyard, as out-of-favor stocks have reversed course, causing short investors to cover their positions, and enticing trend following investors on the long side. The turnaround in the balance sheets of these companies has been dramatic, particularly at Cliffs Natural Resources, with the dramatic reversal in fortunes occurring in less than one year's time. With stock prices that are still depressed today relative to the past decade, there could be more room for appreciation potential, in my opinion, as pessimism gives way to skepticism, which will give way to optimism, and then, if we are lucky, euphoria. Investors and policy makers have a habit of adapting their investment styles to mitigate the consequences of the previous bear market. Thus, today, monetary policy on a global basis is designed to prevent disinflation/deflation, and the resulting framework has provided the most potential to spark an out-of-control inflationary environment since the 1970s, in my opinion. Ironically, while almost everyone is worried about a repeat of 2007-2009, or 2000-2002, or even the Great Depression, the far more likely scenario, from my perspective, is that investors, speculators, and traders face an environment that many have not lived through previously, and that is an inflationary environment. In summary, if you look back over the past 50 years, it has paid dividends to be a contrarian investor roughly 20% to 30% of the time. Thus, every decade, it often pays, sometimes substantially, to have portfolios that are materially different than the market for two or three years out of a 10-year time frame. Being contrarian was rewarding in 2000-2002, and from 2007 to 2009, and I believe we are in the midst one of those crucial several year periods right now. Investors should look for inflationary/reflationary assets to continue to outperform, as they have done since the beginning of 2016. Thus, commodities, commodity stocks, emerging market equities (international equities too), cyclical companies, and financial stocks should continue to have a tailwind for the duration of the bull market, as opposed to the headwind over the past decade. 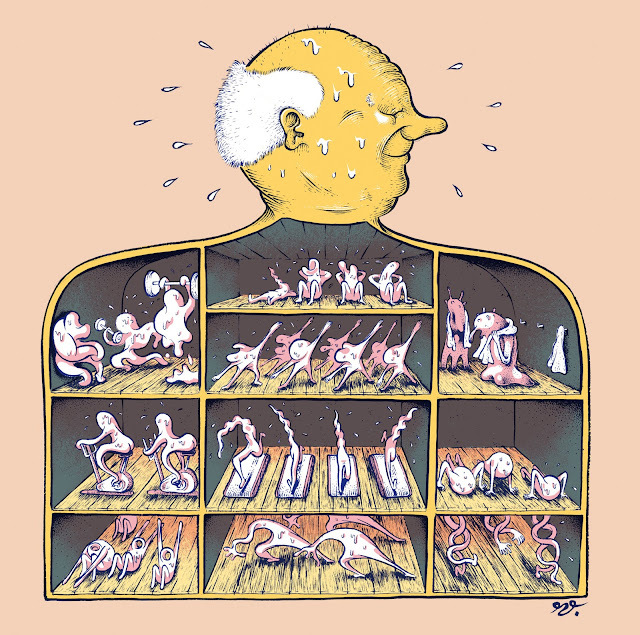 So researchers at the Mayo Clinic in Rochester, Minn., recently conducted an experiment on the cells of 72 healthy but sedentary men and women who were 30 or younger or older than 64. After baseline measures were established for their aerobic fitness, their blood-sugar levels and the gene activity and mitochondrial health in their muscle cells, the volunteers were randomly assigned to a particular exercise regimen. OXFORD – Humankind has always had a tricky relationship with forests. We depend on them to regulate the climate and rainfall, clean our air and water, sustain myriad species of plants and animals, and support the livelihoods of over a billion people. Yet we continue to destroy them, to the point that only half the world’s original forest cover remains. When forests have an economic value, they are more likely to be cultivated than destroyed. And, indeed, trees have been cultivated for profit for millennia. Today, productive forests cover an area of more than a billion hectares, or about one-quarter of the world’s forested land. Opportunities to align economic development with the reduction of greenhouse-gas emissions are rare. Yet that is what reforestation offers. We must take advantage of this opportunity, by pursuing a construction transformation based on restoring trees, the world’s most effective carbon-capture tool. In this “new age of timber,” we would grow wood, build with wood, and allow our forests to thrive.